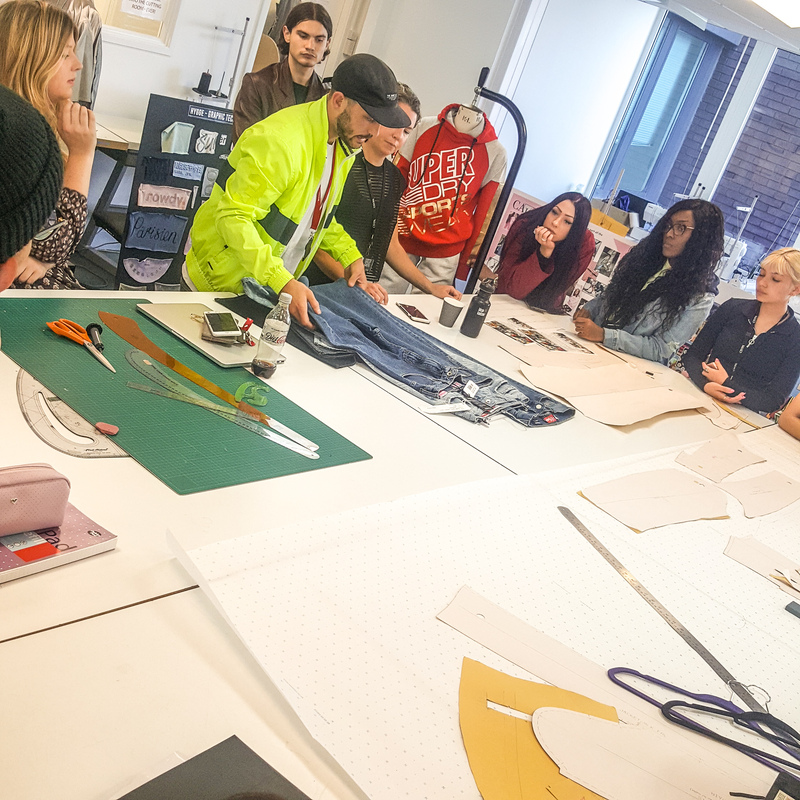 Read how our BA Fashion students worked with designers from Superdry for the opportunity to have one of their designs created. 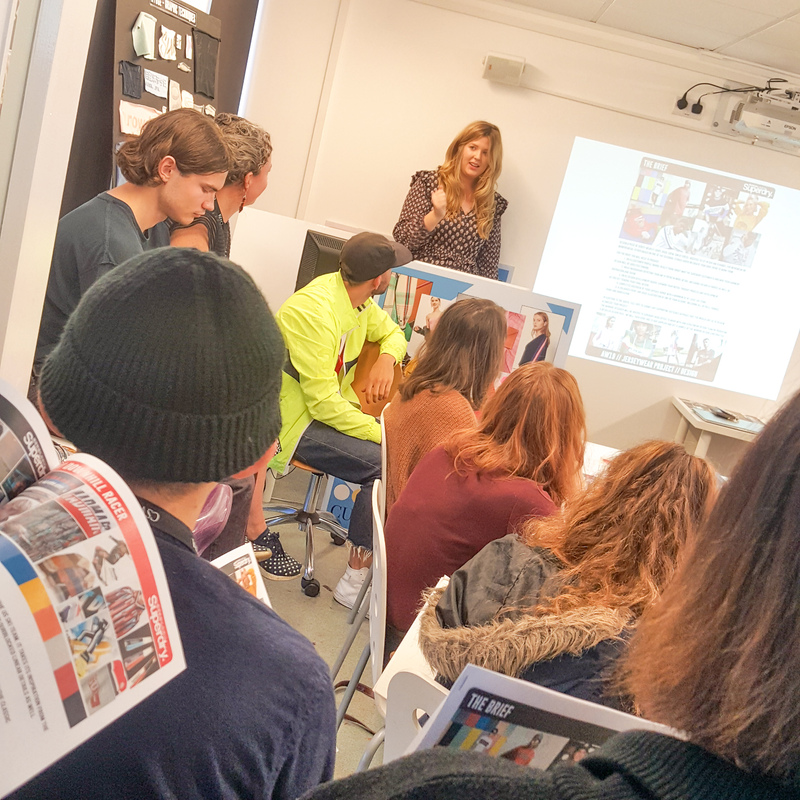 Last week our BA (Hons) Fashion students had the amazing opportunity to have two designers from Superdry teach in class. Both Katie Booth and Joey Twelvetrees from Superdry visited the fashion department to launch an exciting new project. Starting with a talk on current and future trends, our students received insider knowledge on the future of the fashion industry. Then the first years, second years and third years on the Fashion BA all participated in a live brief: To design an item of jersey wear, either a t-shirt, hoodie or sweatshirt, for Superdry themselves! This project and competition is something that only our students at the Cambridge School of Visual and Performing Arts can exclusively be part of. Not only does the winner get to visit Superdry’s headquarters in Cheltenham, UK they will also have their design created as a garment! As part of their visit, Katie and Joey gave fascinating insight into what it’s like to work for a big brand and also told us about their personal career journeys. What did you study and how did you get your first job? Katie 'I studied Fashion at Liverpool John Moores University. It was an amazing, vibrant place to live and my time at university really shaped me as a designer. I was able to experiment and explore my individual handwriting and quickly discovered a passion for the finer details and the finesse of a garment. Straight after graduating I moved to London and began an internship at Holly Fulton, working with Holly and trying to absorb as much as possible. I was really lucky to be given quite a lot of responsibility and detailed work during my internship and working with Holly was a really inspiring time, the whole experience widened my outlook and knowledge of design and the whole start to finish process. I then moved on to Ralph and Russo as an embroidery assistant utilising all the skills learnt during my internship. I felt very privileged to work in such an amazing environment and work on some incredible pieces, travelling to Paris couture week and supporting the larger design team. Joey 'I was initiated into the Design world by drawing clothes for a friend who had just started a clothing company. Calling it “design” was a stretch, but I certainly drew the styles and colour ways, and indicated how I would like them to fit. I later learnt that was probably around 10% of what design actually is! I loved this process though, and decided to go to university and learn how to do it properly. I decided on UWE in Bristol, and studied Fashion Design. UWE was convenient for my lifestyle in the southwest, and as a mature student at 26, I was confident in what it could offer me. I specialised in tailoring, and probably split projects, 70% Womenswear 30% Menswear. This was really beneficial for me; having both genders on my CV and portfolio allowed me to apply for a greater breadth of jobs. Specialising was important at some point in my career, but getting a design position of any sort was a HUGE step forward in my development, and having another string to my bow definitely helped me. 1. The importance of outfitting, and having a commercial eye. 2. Networking. I met some great people at Paul Smith, and the father-in-law of one of those, gave me my first job as a Designer. This experience taught me the importance of getting your name into the industry, on some level, and meeting people. Your never know where it might lead. My job at Superdry also came about in a similar way. I met someone who upon learning I was a designer, introduced me to the Head of Womenswear at Superdry, who then hired me as a Trainee Wovens Designer. I moved to the Denim Department after 3 months, as an Assistant Denim Designer, and am now Junior Denim Designer. I have been at Superdry for just over 2 years now, Denim design is something I would have never even considered 2 years ago, and now it's my complete passion and obsession, which goes to show…be open minded, and be flexible. What advice would you give to students on how to break into the fashion industry? Take every opportunity you can, as it might lead you to a new passion, a new design direction, even if you are set on one career path, try other options and push yourself out of your comfort zone. In addition, provide as many opportunities you can for others. This is something I feel so passionately about, and have been lucky enough to work on at Superdry - creating opportunities for graduates through our university work and Graduate Fashion Week. Absorb everything you can, ask questions and learn from everyone. As designers, we need to be constantly learning new techniques, new trends and new ways of working. There is inspiration everywhere, wherever you travel, whoever you meet and people will always have new things to teach you. Be adaptable, try not to put yourself into a specific box as you start out, you will have more opportunities if you can show that you’re passionate and have an energy to learn new skills. Coming from a luxury/couture background and then moving on to a brand is a huge juxtaposition but if you can show your adaptability and ability to understand and evolve your handwriting you will have so many more opportunities opened to you. Like Katie said: "Take every opportunity you can, as it might lead you to a new passion, a new design direction, even if you are set on one career path, try other options and push yourself out of your comfort zone.” I cannot echo this statement enough; social media might be important, but get out there and meet people. Show them how much you love clothes and working hard. Be flexible, and don’t EVER search for perfection as you’ll never find it. And if you still think you can, your taste will be different next year, so what was all the effort for? Don’t get me wrong, always strive for quality, and make things as good as you can, but understand that things will be different soon, so don’t sweat the small stuff, and be willing to walk away from a concept that isn’t working. Do your research, look at whats out there, and then trust your taste. There are no rules about taste level, and if you genuinely have your finger on the fashion pulse, and know what's going on in the industry, then you have the right to like & dislike anything you want. Don’t be shy about it. Be happy to say, “Yes, I really love that, especially this part…” or “No, that’s not for me, it looks confusing…” These opinions are really important, and you shouldn't take it too personally. To learn more about our BA Fashion course, click here. And to learn about our BA Fashion Branding course, click here.